Reliance Industries Ltd (RIL) is likely to reap profits from its telecom foray only after a decade. An initial investment of about Rs 17,700 crore will be required, which includes Rs 4,800 crore for acquisition of 95% stake in Mahendra Nahata-owned Himachal Futuristics Communications Ltds (HFCL) arm, Infotel Broadband Services, and Rs 12,848 crore for procuring broadband wireless access (BWA) spectrum in 22 circles. 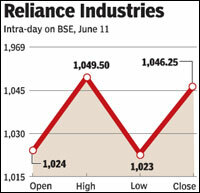 RIL is expected to fund the entire venture through a combination of debt and equity, internal sources said. The company had cash and cash equivalents worth Rs 15,960 crore as of December 31, 2009, and had raised about Rs 9,240 crore by selling treasury stocks in three tranches since September last year. According to analysts, for a pan-India Wimax services roll out, an operator would additionally require a capital expenditure (largely for equipment) of about Rs 10,000-12,000 crore to target about 50-60 million users. RIL would also have to strike a deal with tower infrastructure providers. Mritunjay Kapur, managing director at audit and risk management firm, Protivity Consulting, said, We expect a capital investment of about Rs 10,000 crore- Rs 12,000 crore for a target of 50-60 million subscribers at an average rate of Rs 1,800-2,000 per subscriber on equipment. It is quite likely that providers would want to roll out all-India services in the next two to three years. India currently has about 8.75 million broadband connections at the end of March 2010, according to the Telecom Regulatory Authority of India. This, however, brings a huge opportunity for RIL to expand services into urban and rural areas as Wimax supports only data services. Reliance Industries to ring in telecom profits after a decadeHowever, analysts believe though it would be a high cost-high tariff game for Wimax providers, a lot would depend on how the long-term evolution (LTE) technology pans out in India. Prashant Singhal, partner and telecom industry leader, Ernst & Young, said, We expect a return on investment for Wimax providers to be at least 7-8 years. At the same time, Wimax isn't expected to attract huge subscriber additions like voice services do. We expect a subscriber addition of 2-3 million per month in Wimax, about 15% of the 15-20 million subscriber addition in the voice market. We, therefore, do not expect a significant growth as the base is far less, said Sandeep Ladda, executive director at PricewaterhouseCoopers. WiMAX is an emerging technology and globally, operators appear to have a more favourable view on LTE, the major competing 4G technology for WiMAX. Harit Shah, an analyst at stock broking firm Karvy, said, Investment into 4G technologies is a risk.